Spring is in the air, which can only mean one thing — it’s time for your annual spring cleaning! 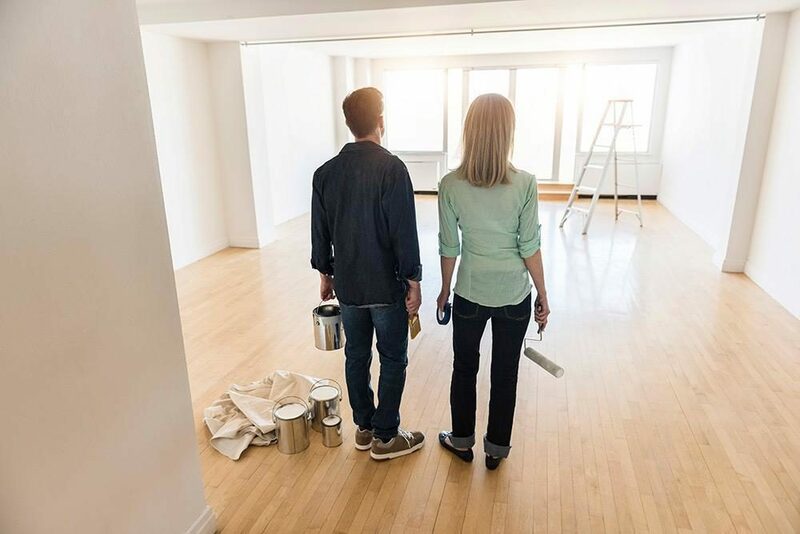 As you get ready to drag clutter out of closets and put away winter clothing and bedding, stop for a moment and consider: could your home benefit from adding a paint project to this year’s spring cleaning list? While wiping down walls can clean them up, nothing says springtime like adding a whole new fresh coat of paint. Here are three paint project ideas to make your home feel like new this spring. 1. Repair dents and dings in high traffic areas. We all have that one hallway, corner, or kitchen wall that gets brutalized during everyday family life. Maybe it’s the corner in the entryway where your kids toss all of their shoes and sports equipment, or possibly it’s the upstairs hallway wall that’s scuffed up from all the back-and-forth traffic it endures every day. You’d be surprised at how taking time to repair and paint over this buildup of scuffs, dings, and dents can give a well-worn part of your home a new look. All you need for this paint project is a putty knife, 120-grit sandpaper, primer, drywall compound or putty, paint that matches the original wall color, and the same type of paint brush that was used to paint it the first time around. Start by cleaning the damaged area, taking care to remove any loose bits and pieces. Allow the area to dry thoroughly before sanding the area and applying primer to seal it. Next, apply the drywall compound or putty into the dent or hole, making sure to spread it out a bit around the damaged area so that it will better blend in with the surrounding wall. Allow the putty to dry before sanding it to smooth it out. Finally, apply the paint to make the area as good as new! 2. Kick the year off with a brand-new color. For the ultimate DIY home transformation, choose a room in your home and paint it an entirely new color. This may mean moving the kitchen from a traditional yellow to one of the more modern gray tones that are popular now or taking your white bathroom walls from blah to spa by painting it in a natural water blue or light green color. A paint project that involves choosing a brand-new color can feel intimidating, and those tiny paint chip swatches from the hardware store don’t do a good job of letting you know what the color will actually look like once it’s up on your wall. This is why many homeowners use applications like SureSwatch temporary color swatches to test out new paint colors before actually committing to them. SureSwatch lets you test out one color on different walls, in various rooms, as well as allows you to test one shade against another, side-by-side. 3. Freshen up old paint with a new coat. Finally, consider brightening things up while keeping them the same. Maybe you’re in love with the color of your kitchen, and perhaps it doesn’t have any major dents or damage. Still, paint fades as it ages, and the rooms in your house may benefit from a fresh coat of paint. Even if you aren’t prepared to change colors entirely or don’t need to pull out the putty knife and sandpaper, don’t discount the transformation that a fresh paint job can bring. In some cases, you may have difficulty finding your old color — especially if it’s been a long time since the room was first painted. If this happens, use small sample cans of similar shades, paint them onto SureSwatches, and place them around the room. This will help you pick the color that best matches the one you’ve loved for years … and will continue to enjoy for years to come. Want more great ideas for your next paint project? Check out our painting tips for ideas and inspiration!